There is a concert on October 25th 2018 in Newcastle upon Tyne. The concert starts at 7.30pm at the Lit & Phil, 23 Westgate Road in Newcastle upon Tyne. It features Lydia Abell (Viola), Dawn Allen and John Garner (Violin), Sarah Robinson (Piano), Students of the Royal Grammar school and the Sage, Gateshead and members of the Cobweb Orchestra. 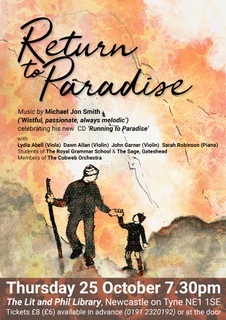 The CD Running To Paradise with music by Michael Jon Smith is to be presented at the concert. Music by Michael Jon Smith is to be played at the concert. On February 4th 2018 Running to Paradise is to be presented at Heeswijk Castle. A coffee concert is planned starting at noon till 1pm. It’s possible to combine this event with a visit or tour of Heeswijk castle. The CD Running to Paradise has been released. Running to Paradise has also been released digitally ! The album is available to buy at cdbaby.com, all proceeds going to Stichting Michael Jon Smith. Short clips of each track are also available there. Running to Paradise is scheduled to be released on every other major digital platform too ! The financial statement for 2016 has been published. Recording for the CD, Running to Paradise, was completed in 2016. Preparations for the production of the CD are in the final stages. The CD is expected to be published in the summer of 2017. There will be a concert on May 7th 8:15 PM in the pianola museum in Amsterdam. This concert is the kick-off for our CD recording project, which has been organised for this year ! Ordering tickets beforehand is advised. Tickets will be 10 euro. with the details (Concert Michael Jon Smith, May 7th 8:15 PM) of the concert. You will receive an answer about the availability and how to pay for your tickets. Your tickets will be available at the counter. The museum is open from one half hour before the concert starts. Please note: If a concert is cancelled, you will get notice and you will get a full refund of the money you paid for the tickets. The financial statement for 2015 has been published. Meanwhile preparations are ongoing for the recordings early next year. For august 2015 our sister organisation in England has organized two concerts in Newcastle and Edinburgh. On April 13th 2013 Stichting Michael Jon Smith was presented in the Pianola Museum in Amsterdam. Due to the limited seating arrangements this was a closed event. After the opening friends of Michael played several of his compositions. The organisation would like to thank them and all of the people who attendend this event.